The Treasury Department and Internal Revenue Service (IRS) have issued initial guidance under Notice 2018-68 (“Notice”) on the amendments to Internal Revenue Code Section 162(m) made under the Tax Cuts and Jobs Act of 2017 (“TCJA”). The Notice provides guidance on the definition of “covered employee” and the transition rule. 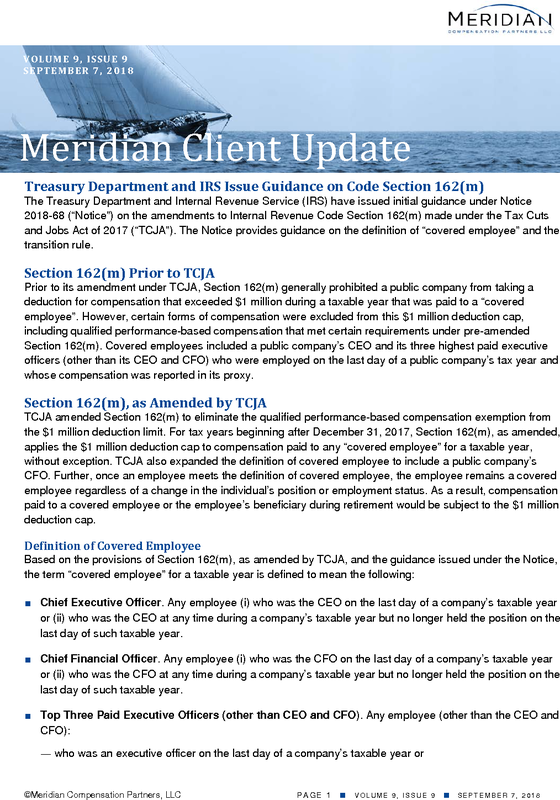 Prior to its amendment under TCJA, Section 162(m) generally prohibited a public company from taking a deduction for compensation that exceeded $1 million during a taxable year that was paid to a “covered employee”. However, certain forms of compensation were excluded from this $1 million deduction cap, including qualified performance-based compensation that met certain requirements under pre-amended Section 162(m). Covered employees included a public company’s CEO and its three highest paid executive officers (other than its CEO and CFO) who were employed on the last day of a public company’s tax year and whose compensation was reported in its proxy. TCJA amended Section 162(m) to eliminate the qualified performance-based compensation exemption from the $1 million deduction limit. For tax years beginning after December 31, 2017, Section 162(m), as amended, applies the $1 million deduction cap to compensation paid to any “covered employee” for a taxable year, without exception. TCJA also expanded the definition of covered employee to include a public company’s CFO. Further, once an employee meets the definition of covered employee, the employee remains a covered employee regardless of a change in the individual’s position or employment status. As a result, compensation paid to a covered employee or the employee’s beneficiary during retirement would be subject to the $1 million deduction cap. ■ Chief Executive Officer. Any employee (i) who was the CEO on the last day of a company’s taxable year or (ii) who was the CEO at any time during a company’s taxable year but no longer held the position on the last day of such taxable year. ■ Chief Financial Officer. Any employee (i) who was the CFO on the last day of a company’s taxable year or (ii) who was the CFO at any time during a company’s taxable year but no longer held the position on the last day of such taxable year. ― who was an executive officer at any time during a company’s taxable year but no longer was an executive officer (or even an employee) on the last day of the taxable year, and whose compensation placed the employee among the three highest compensated executive officers for a company’s taxable year, regardless of whether the employee’s compensation is subject to disclosure for the company’s last completed fiscal year. The application of the foregoing definition of covered employee would have varying outcomes depending upon whether and, to what extent, executive officers terminate or no longer serve in an officer position at year-end (“Former Executive Officer”). If for a taxable year a company does not have any Former Executive Officers, then the company’s three proxy-disclosed executive officers (other than the CEO and CFO) would be covered employees under the above definition. However, if for a taxable year a company has a Former Executive Officer whose compensation for such taxable year exceeded the compensation of the lowest paid proxy-disclosed executive officer (other than the CEO and CFO), such Former Executive Officer would be a covered employee for such taxable year. Theoretically, for a taxable year, a company’s covered employees (other than the CEO and CFO) could be three Former Executive Officers. This would be the case when each Former Executive Officer’s compensation exceeds the compensation of the highest paid proxy-disclosed executive officers (other than the CEO and CFO). ■ Continuing Covered Employee. Any employee who was a covered employee for any taxable year beginning after December 31, 2016 would continue to be a covered employee in future taxable years. For taxable years beginning prior to January 1, 2018, covered employees are identified in accordance with Section 162(m) prior to its amendment under TCJA. The chart below shows the maximum number of covered employees that may be identified each taxable year under each of the above four categories. ■ Such contract was not “materially modified” on or after that date. The deductibility of compensation grandfathered under the transition rule is determined under Section 162(m) prior to its amendment under TCJA. The Notice provides the following guidance on the definition of written binding contract. ■ Meaning of written binding contract. A written binding contract means a contract that was in effect on November 2, 2017 under which a company is obligated under applicable law (for example, state contract law) to pay compensation to an employee if the employee performs services or satisfies the applicable vesting conditions. The Notice indicates that if compensation paid to an employee exceeds the amount that a company is obligated to pay under a written binding contract on November 2, 2017, such excess compensation would not be considered paid under a written binding contract and therefore would not be grandfathered under the transition rule. By way of an example, the Notice suggests that when a company has discretion to reduce otherwise earned amounts under an agreement in effect on November 2, 2017, such agreement would not constitute a written binding contract and any amounts paid thereunder would not be grandfathered under the transition rule. This is consistent with the conference committee summary to TCJA, which indicated that the written binding contract requirement might not be met in cases where amounts payable under an incentive plan are subject to company discretion. ■ Employee participation. Compensation paid to an employee under a written binding contract in effect on November 2, 2017 will be grandfathered under the transition rule even if the employee was not eligible to participate in the plan on such date. However, the employee must have been employed on November 2, 2017 by the company that maintained the plan or arrangement, or the employee had the right to participate in the plan or arrangement under the written binding contract as of that date. ■ Compensation paid under “renewed” written binding contract is not grandfathered. If a written binding contract is “renewed” after November 2, 2017, any compensation paid under the renewed contract would not be grandfathered under the transition rule and therefore would be subject to Section 162(m), as amended by TCJA. When a contract is considered renewed depends on its specific renewal or sunset provisions, as illustrated in the below examples included in the Notice. ― Auto renewal provision. If the terms of a contract provide that it will be automatically renewed or extended as of a certain date unless either the company or the employee provides notice of termination of the contract at least 30 days before that date, the contract is treated as renewed as of the date that termination would be effective if that notice were given. Thereafter, any amounts paid under the contract would not be grandfathered under the transition rule and would be subject to Section 162(m), as amended by TCJA. ― Sunset provision. If the terms of a contract provide that the contract will be terminated or canceled as of a certain date unless either the company or the employee elects to renew within 30 days of that date, the contract is treated as renewed by the company as of that date (unless the contract is renewed before that date, in which case, it is treated as renewed on that earlier date). However, certain renewal and sunset provisions will not result in a contract being treated as renewed, as illustrated in the below examples. ― Employee may require company to remain bound to contract. If the company will remain legally obligated by the terms of a contract beyond a certain date at the sole discretion of the employee, the contract will not be treated as renewed as of that date if the employee exercises the discretion to keep the company bound to the contract. ― Contract terminates upon end of employment relationship. A contract is not treated as terminable or cancelable if it can be terminated or canceled only by terminating the employment relationship of the employee (e.g., a contract with an indefinite term). The Notice provides the following guidance on what constitutes a material modification of a written binding contract. ■ Definition and effect of material modification. A material modification occurs when a written binding contract is amended to increase the amount of compensation payable to an employee, except in the case of an amendment to increase compensation to reflect no more than a reasonable annual change in cost of living. If a written binding contract is materially modified, it is treated as a new contract entered into as of the date of the material modification. Amounts received by an employee under the contract before a material modification remain grandfathered under the transition rule, but amounts paid after the material modification are treated as paid pursuant to a new contract, rather than as paid pursuant to a written binding contract in effect on November 2, 2017. In such case, amounts paid after the material modification would not be grandfathered under the transition rule. ― Acceleration of payment. A modification that accelerates the payment of compensation will be treated as a material modification unless the amount of compensation paid to the employee is discounted to reasonably reflect the time value of money. ― Deferral of payment with no accrual of earnings or interest. A modification that defers the payment of compensation with no accrual of earnings or interest will not be treated as a material modification. the accrued earnings are based on investment gains or losses attributable to a predetermined investment (whether or not assets associated with the deferred amount are actually invested). ■ Effect of other circumstances relating to a written binding contract. ― Supplemental contract or agreement. A written binding contract may be indirectly subject to a material modification when a company adopts a supplemental contract or agreement that provides for the payment of compensation to a covered employee. 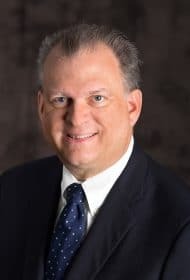 Whether such supplemental contract or agreement constitutes a material modification of an existing written binding contract would be determined on a facts-and-circumstances basis. In particular, if the facts and circumstances show that a supplemental contract provides for the payment of compensation on a substantially similar basis as an existing written binding contract, such supplemental contract likely constitutes a material modification of the written binding contract. ― Failure to exercise negative discretion. The failure, in whole or in part, to exercise negative discretion under a written binding contract does not result in the material modification of that contract. Presumably, the foregoing only relates to circumstances where a company’s right to exercise negative discretion is limited to only an express portion of amounts otherwise earned under a written binding contract (e.g., a company may exercise negative discretion to reduce an employee’s incentive payout by up to 25%). This interpretation is consistent with the Notice which suggests that if a company has the discretion to reduce to zero an otherwise earned incentive payout under a compensatory arrangement, such arrangement would not satisfy the written binding contract requirement. Companies should note that the transition rule has implications for both incentive compensation and non-incentive compensation arrangements. ■ Incentive Compensation Arrangements. The implications for incentive compensation arrangements are relatively straightforward. If an incentive arrangement satisfies the transition rule, then amounts paid under such an arrangement would be subject to Section 162(m) prior to its amendment under TCJA. This means the determination of whether the recipients of such incentive payout are covered employees and whether the incentive payouts are exempt from or subject to the $1 million deduction cap would be made under prior law. Therefore, if the incentive payout satisfied the requirements for performance-based compensation under prior law, then such payout would be exempt from the $1 million deduction cap and would be fully deductible. ■ Non-Incentive Compensation Arrangements. The application of the transition rule to non-incentive based compensation may be less obvious, but its implications may nonetheless be significant. For example, assume on November 2, 2017 a company (with a 12/31 year end) grants its CEO time-based restricted stock units (RSUs) that cliff vest and are settled after four years of service but immediately vest and are settled upon an involuntary termination without cause. On November 2, 2020, the CEO is involuntary terminated and the RSUs immediately vest. Assuming that on the settlement date the RSUs satisfy the transition rule, the determination of whether the CEO is a covered employee in 2020 would be determined under prior law. Since the CEO was not employed on the last day of the company’s taxable year, the CEO would not be treated as a covered employee under prior law and therefore compensation realized from the vesting of the RSUs would not be subject to the $1 million deduction cap. The Treasury Department and the IRS anticipate that the guidance in the Notice will be incorporated in future regulations that, with respect to the issues addressed in this Notice, will apply to any taxable year ending on or after September 10, 2018. Any future guidance, including regulations, addressing the issues covered by this Notice in a manner that would broaden the definition of “covered employee” or restrict the application of the definition of “written binding contract” will apply prospectively only. The IRS and Treasury Department have requested comments be submitted on additional issues under Section 162(m) that future guidance, including regulations, should address. Specifically, comments are requested on (1) the application of the definition of “publicly held company” to foreign private issuers, including the reference to issuers that are required to file reports under Section 15(d) of the Securities Exchange Act of 1934, (2) the application of the definition of “covered employee” to an employee who was a covered employee of a predecessor of the publicly held company, (3) the application of Section 162(m) to companies immediately after they become publicly held either through an initial public offering or a similar business transaction, and (4) the application of the SEC executive compensation disclosure rules for determining the three most highly compensated executive officers for a taxable year that does not end on the same date as the last completed fiscal year. ■ By mail: Send submissions to CC:PA:LPD:PR (Notice 2018-68), Room 5203, Internal Revenue Service, P.O. Box 7604, Ben Franklin Station, Washington, DC 20044. ■ By electronic delivery. e-mail address: Notice.comments@irscounsel.treas.gov. Please include “Notice 2018-68” in the subject line of any electronic communication. All material submitted will be available for public inspection and copying.